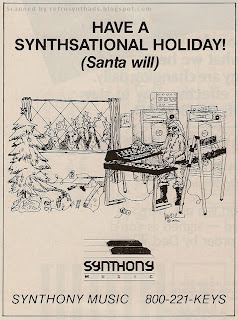 Synthony Music's "Have a synthsational holiday! 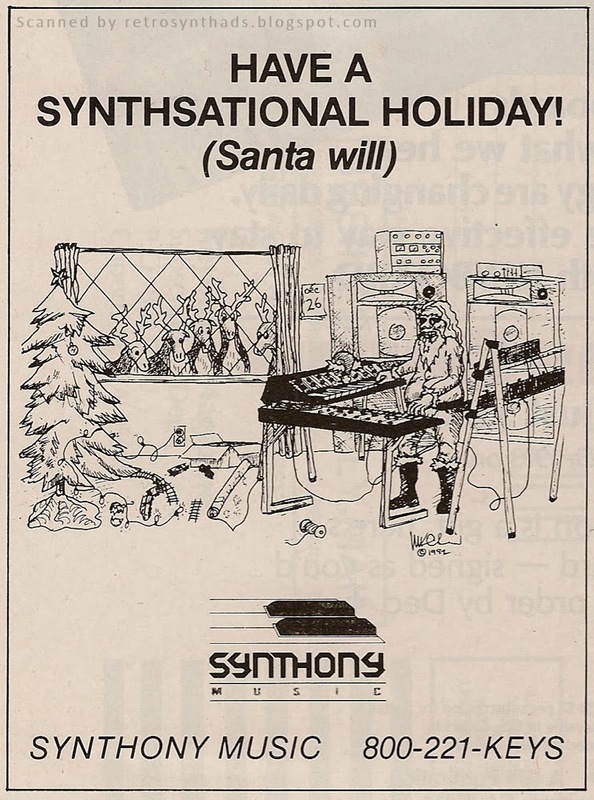 (Santa will)" quarter page black and white advertisement from page 20 in the December 1983 issue of Keyboard Magazine. Taking a break from the rum and eggnog to bring you this piece of lovely history. A quick Google search brought up the Synthony Music Web site, or what has now become "Synthony Music's Synth & MIDI Museum". On that home page was link to a letter from the founder of the company - Bill Cone (or as he called himself... the Zoo Keeper). The company originally started 1982 with the goal to "provide the best products available, technical assistance, guidance, and a forum for those brave enough to embrace the then new technology in music." Unfortunately, they closed their doors in early 2004 after nearly 22 years in the business. The online museum does provide some good info, but was last updated back in 2010 according to the museum's home page. Still a great resource. Time to get back to the rum and eggnog. Army Brat Biofeedback Headband MIDI interface 1/6-page black and white advertisement from page 116 in the July 1985 issue of Keyboard Magazine. There isn't much that could have pulled me out of my blogging semi-sabbatical, especially during this cold, cold December. But this little gem managed to get me out of the studio and into the office where the lonely scanner sits. One word... or three, depending on how you look at it. Only an Army Brat with access to certain sensitive files, would be crazy enough to do this." "In 1969 a Special Army Intelligence Group in collaboration with the C.I.A spent 15 years and millions of dollars developing a project based on para-kinetic theories. 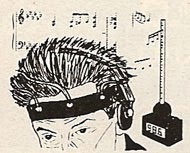 Even though they did succeed in the design of a device capable of linking a man, with electrodes taped to his temples, to an instrument instantly sampling his impulse and converting waveforms to voltage, some Senate sub-committee labeled the whole project "Questionable", and it ended up on a defense scrap heap." Remember - this was 1985. MIDI had only been around for a short period, but the technology was moving fast. The smaller ads at the back of Keyboard that were historically promoting perfect-pitch, piano-tuning and vocal-eliminator boxes were slowly being overrun by a new wave of start-ups pushing MIDI software, patches and RAM cartridges for synths like the DX-7. But this biofeedback system must be a one-of-a-kind for the time period - in Keyboard Magazine anyways. Just look at the drawing of the dude with the headband and headphones (not included according to the ad), as well as the "black box" with what looks to be an antenna sticking out of it. "Towards the end of the 1980s, the advent of digital signal processing systems and the wide availability of powerful personal computer systems made it possible for researchers to further develop the existing techniques for biosignal analysis in real-time applications. In 1988, California-based scientists Benjamin Knapp and Hugh Lusted introduced the BioMuse system (Knapp and Lusted 1988), which consisted of a signal-capturing unit that sampled eight channels of biosignals, which were then amplified, conditioned and translated to midi messages. The sensors were implemented as simple limb-worn velcro bands that were able to capture EMG, EEG, EOG, ECG and GSR signals. The BioMuse system, facilitated not only the analysis of the signals, but also the ability to use the results of the analysis to control other electronics in a precise and reproducible manner that had not been previously possible (Knapp and Lusted 1990)." So, I'm guessing the only logical conclusion I can come up with is that Knapp and Lusted were obviously avid readers of the back half of Keyboard and must have come across this advertisement by Army Brat. How else could they have created their BioMuse system without the help from the CIA and Army Intelligence? And its even more surprising considering that Army Brat was trying to keep the whole thing on the down-low. "We're trying to keep as low a profile as possible, but don't know how long we'll go undetected. GET IT NOW!!!"